First, before the food, a food news! I have the honor to announce that I am now one of the online editors at www.tastespotting.com. As most of you know, tastepostting is a great outlet for all of us food blog owners, and I have been using it for months. I cannot overstate how happy I am to be a part of the project. I have already discovered dozens of wonderful blogs through all the photographs submitted to the site and it's been great to be a part of the approval process. I look forward to discovering more of the blogs out there! Now.. for this little dessert. There are those days when you're just not in the mood to make a real, rustic tart dough. Yesterday was one of those days. Let's face it, no matter how much you like to cook, there will be days when you want to take the easy way out. For some it might be take-out or running to the closest pastry shop, but for me it's going for a quick substitute. Clafoutis is possibly one of the easiest ways to make a fruit tart without worrying about making dough. It's as simple as cutting fresh fruit and pouring a sweet custard mixture over top. I have also been meaning to try out this simple caramel recipe we used to make at culinary school and to tweak it a little at home. It's the easiest caramel sauce, and we would use it to decorate our dessert plates. I decided to add a touch of 'fleur de sel'- a gourmet hand-harvested salt - which added a nice hint of salty goodness. Fleur de sel is quite a pricey ingredient, but I've really grown to love what it adds to meals. In this case, it turned a simple caramel sauce into a burst of different flavors. Butter each mold lightly, sprinkle some sugar and tap off excess. Meanwhile, peel,core and cut the pears into thin slices. Using about half a pear per mold, gently arrange the slices so as to cover the bottom of each mold. Pour the batter over the pears. Bake until the top is golden brown and the custard is set. This will take about 40 minutes. In a pan on medium heat, add the sugar and water. Without stirring, let the sugar dissolve in the water (until the mixture looks like water only). Once it has, let the mixture come to a simmer. At this point, you can gently swirl the pan around. Be extremely gently (and stay concentrated) because the mixture is extremely hot. Keep a watchful eye on the mixture, and wait for it to turn a nice mahogany color. It will take about 6-7 minutes to change colors, but once it has started it will go very quickly. The sugar also burns very fast once the color changes, so be careful. Once the caramel has reached the right color, remove from the heat and slowly add the cream. If the sugar starts to harden, place back on low heat for a couple minutes and let the sugar melt down. Once the mixture is homogeneous, set aside and leave to cool. The caramel sauce can be stored in the fridge, and gently re-heated before using. Enjoy! Wow, what a great recipe! I absolutely adore caramel sauce with sea salt. I have to put this in my recipe file. Congratulations on the internship! I hope this means that entries will be accepted quicker, and poor Sarah can get some sleep! Ohhh a big congrats to you! How exciting to do an intern like that? Well, judging from your food blog I'ms ure you're going to be perfect at it; all your photos are stellar. 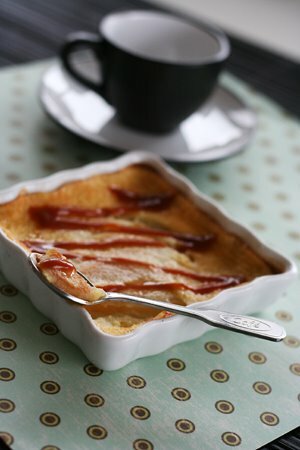 Love this pear clafoutis--isn't everything better with caramel? Congrats on the internship! This dessert looks wonderful. How do you find the time to make all these things? Congrats—must be fun to look at all those photos! Anonymous: I do, I just made the change. Thanks for noticing the mistake! Great recipe - I will give it a try for sure. And congrats on the internship - it's one of my favorite places to find great food ideas. What a gorgeous dessert. I am sure the caramel sauce puts it over the top! Congrats on the tastespotting deal - how fun! THis looks absolutely delicious! Congrats on the editor gig! Talk about a job that will constantly make you hungry! Totally loving this - this looks divine! Congratulations! Tastespotting clearly knows how to "spot" great talent. I'll keep checking in to see your beautiful morsels. PLEASE feel free to stop by mine, anytime, too. I'd be so honored to have you! Congratulations! What a fun new experience for you. I do not have fleur de sel even though I have about 15 other kinds of salt. But when I do one of the first things I plan is with caramel. Congrats on being one of Tastespotting's online editors! You will now forever be hungry! That clafoutis looks lovely!!!!! Two of y all time favorties together!! Oh Yeah Baby!! Mmm...love fleur de sel caramel... And congrats on the Tastespotting gig! I just discovered that web site and it's great :). TasteSpotting is a great way to discover great new food and food blogs. That pear clafoutis looks good. I like the caramel sauce on it. I have sent you an award on my blog...check it out. mia: Bourbon is a great addition to caramel sauce! dawn: I would have to agree. Any dessert is better with a little caramel! Rubybean77: Thanks so much for the award! I'm glad you are enjoying the recipes - let me know if you try some of them out! Congratulations on your involvement with Tastespotting! I love this dessert and in particular the addition of Fleur de Sel. Delicious! I tried a clafouti once and sad to say it was just not good I should definitely take your queue and learn how to make this one! What a wonderful twist on the old French classic! Beautiful dessert!